Are you using the best international trade term for your exports? If you’re new to international trade, you might feel overwhelmed when discussing which Incoterm you should use for your export sales. Using the wrong term could mean you are liable for transportation and other fees you hadn’t built into the price of your goods. 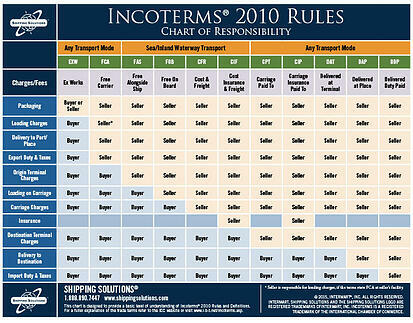 Download this Incoterms Chart of Responsibilities so you can quickly identify which fees and potential liabilities you face under each of the 11 trade terms. You can use this information to either negotiate a different term with the importer or make sure you price your goods properly.